Welcome to the land of… Pesto? Genoa, the largest seaport in Italy, has long been revered as the proud one. Of course, as the birthplace of Paganini and Colombus, the Genovese have a reason to be. The gateway to the region of Liguria gifted with stunning views of the Mediterranean seaside, this city is a very convenient place to stay in while exploring the natural wonders and colourful villages of Northwestern Italy. The architecture might pale in comparison to well-loved Italian cities but the cuisine makes up for it. Of course all Italian cities boast of their cuisine but Genoa is definitely on top of the list. Home of Italian classics such as pesto sauce and foccacia, Genoa is a feast for the foodie. Scrumptious gelatos to finish your meals are also in every corner. Long stretches of seaside promenade can be enjoyed by Corso Italia as well as the old town center’s cobblestoned and steep alleys to burn the extra calories whilst appreciating what is left of the once royal city. Medieval and baroque structures are a blend along the small streets of the city with huge and small churches popping out here and there. The smell of freshly baked foccacia and hot espresso in the air also adds another dimension to your sightseeing. Indeed, getting lost in the winding old streets can be both a nightmare and a delight. 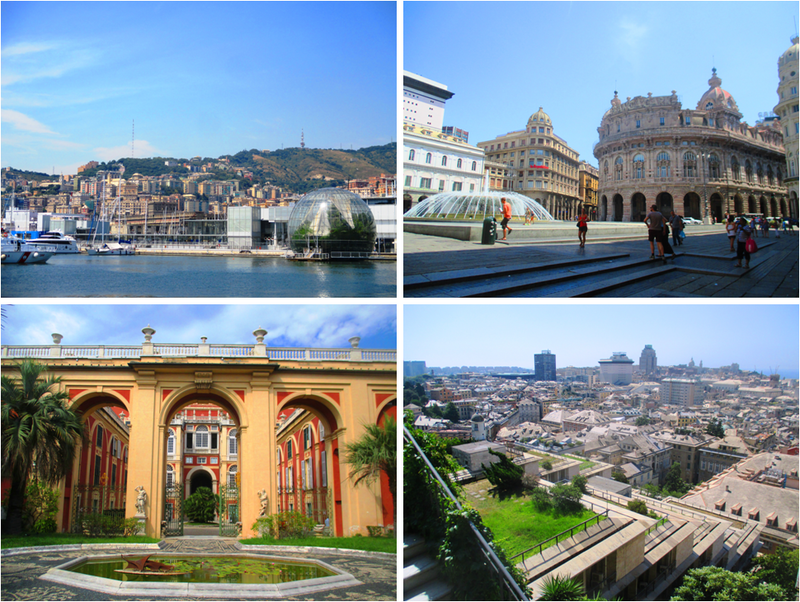 Clockwise from Top Left: Porto Antico or the old harbour, Piazza Ferrari, A part of the stunning panoramic view of Genoa from the Castelletto viewing point, and the 16th Century Palace of Genoa. The harbour and marina are also sights of their own, showing modern structures such as the colossal aquarium surrounded by some boats and cruise ships with a dense pack of old colourful apartments in the background. Scenic views await a climb to the Spianata Castelletto after enjoying the UNESCO world heritage branded street of palaces – Via Garibaldi. Piazza Ferrari (everybody’s rendezvous place), surrounded by ornate buildings, is a superb stop for a photo. A sweet escape to the Boccadasse seaside district with small beaches is also recommended especially if you want to just lay back down and feel the cold whispers of the Mediterranean. Such an underrated city! I visited Liguria in 2013 but did not make it to Genoa . Lovely pictures!